Mangaluru, Feb 05, 2019: Hephsiba Rani Korlapati, presently MD, Special Purpose Vehicle, Hubballi-Dharwad, has been transferred as Deputy Commissioner of Udupi district. Priyanka Mary Francis has been transferred to the post of Director, Department of Tourism, Bengaluru. Ms. Francis served as Chief Executive Officer of Udupi Zilla Panchayat from November 17, 2015. She took over as Deputy Commissioner of Udupi district on February 23, 2017. DC Francis became popular in the State when she personally conducted mid-night raids on illegal sand removal sites in Udupi district on April 2, 2017. Her convoy was assaulted by illegal sand extractors, leading to cases being booked against them. She also took several initiatives to promote tourism in the district. 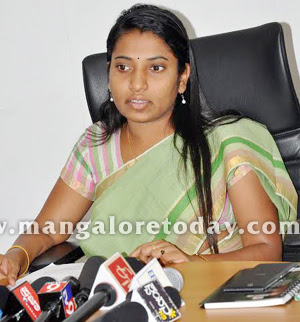 DC Francis said that she enjoyed her tenure in Udupi district. “It was a learning experience and I will use it in my career,” she said. DC Francis is likely to hand over charge to Ms. Korlapati in a day or two.